Confession: I am a complete Olympic nerd and junkie. Growing up I always enjoyed those two weeks every two years when I could sit down with my family and watch the world’s finest. I couldn’t get enough. I’d read books. I searched the internet. I stocked up on Sports Illustrated. Then I’d spend my spare time sketching Olympic athlete after Olympic athlete. I grew up with a passion for art. After an advanced art class in 5th grade I become infatuated with drawing portraits. Later this morphed into sports photos. I studied Exercise Science in college. With so many anatomy classes and so much history with sports sketches you can see my fascination with the body. Now as I think about it, the interest is not about physical perfection or muscle definition, it’s about limits. I am a thoughtful person. Straight-up, I’m one of those positive thinking, meditating, peaceful, hippy types. And I’m okay with that. I thoroughly enjoy my thought process-that’s part of the reason I don’t drink anymore, I like what’s going on in my head. That being said I am a firm believer in infinite possibilities. I think we each hold an unfathomable amount of potential in each of us. I notice lately how I like to test this. Often they’re little test or sometimes they’re bigger. I’m always testing who I think I am (or who I should be) vs. the great me. I live for a challenge. If I perceive something to be harder, count me in, excitement is through the roof. I’ve hiked more in the snow, ice, and sub-zero temperatures in Indiana than I did all Fall. However, if I think something is easy the excitement takes a dip, as does the energy. School for instance was a breeze. I rarely studied or tried. Unless someone told me a class was ‘hard’. Boom here comes the Brittany who wants to be extraordinary. That’s it, I want to believe in my own greatness. To me the Olympics kind of represents this. The best athletes from all over the world. Athletes who have over come the odds. Who have trained their whole lives. Who have faced challenges. Who have faced injuries. But despite whatever their back story, they’re here in Sochi fulfilling their passion. 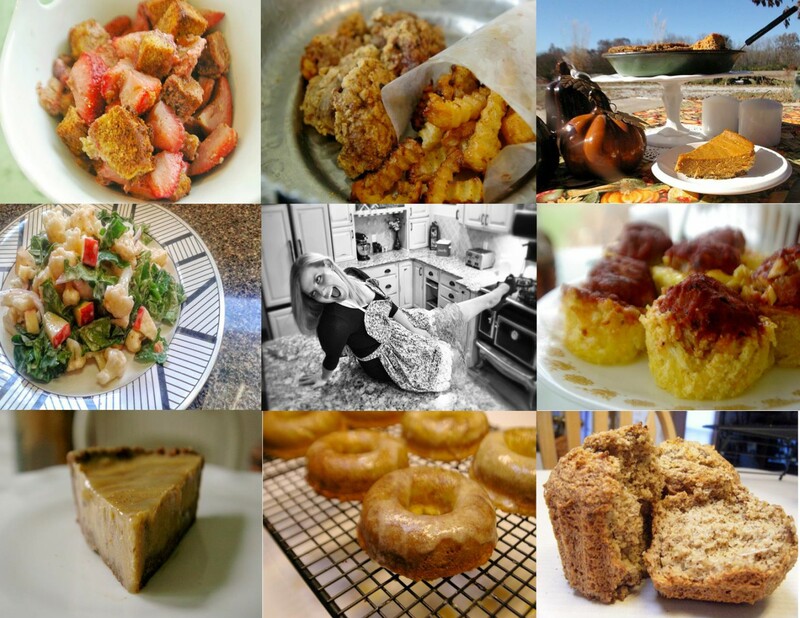 I am a homegrown Indiana girl. 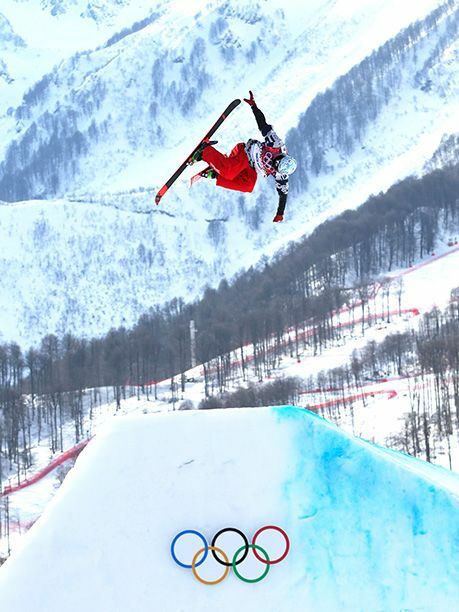 An athlete who I think demonstrates this anything is possible mentality is Nick Goepper. As I’m watching the freestyle ski I hear “from Indiana.” What?!?! A professional skier from Indiana? I don’t know if you’re aware but Indiana is not a mountain state. We are more known for cornfields, than anything resembling a slope. How does a kid from Indiana make it to Russia? Awesome, it is just awesome. I like that the Olympics brings people together. Not just in a national sense, but in the human spirit. We want to cheer on people doing their best. We want to see the underdog pull through. It was so cool when Jeremy Abbott finished after he fell down. I literally cringed when I saw it. But he got up and finished, landing all his jumps. Okay, I admit the patriotism is sweet. All the red, white, and blue. The excitement of the US hockey team beating Russia in Russia 24 years after Lake Placid.We feel connected to other Americans. United as a country behind our athletes. It brings us together as families. I’ve watched it with my grandmother, my parents, my sister, my brother, my nephews, my best friends, with my friends’ parents. Most of all I enjoy watching it with my nephews Gavin and Trenton. What 4 year-old watches curling? It’ adorable. Gavin’s decided he wants to do the biathlon. And Trenton wants to be a snowboarder, which I may have encouraged. 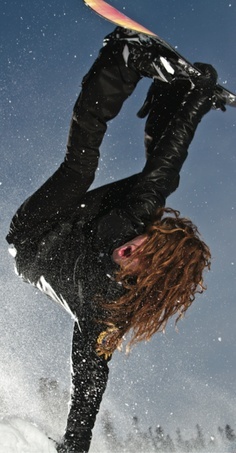 I remember being such a big fan of Shaun White in high school the first time I saw him snowboard. Plus I loved that he was also a professional skateboarder. Needless to say I’ve drawn a few sketches of Shaun in the past. Trenton went wild with the idea of being Shaun. He goes in his room only to come out in his snowboarding gear and a burst of energy which lasted hours, of him performing tricks (mainly spinning in circles). Those great little moments in life. 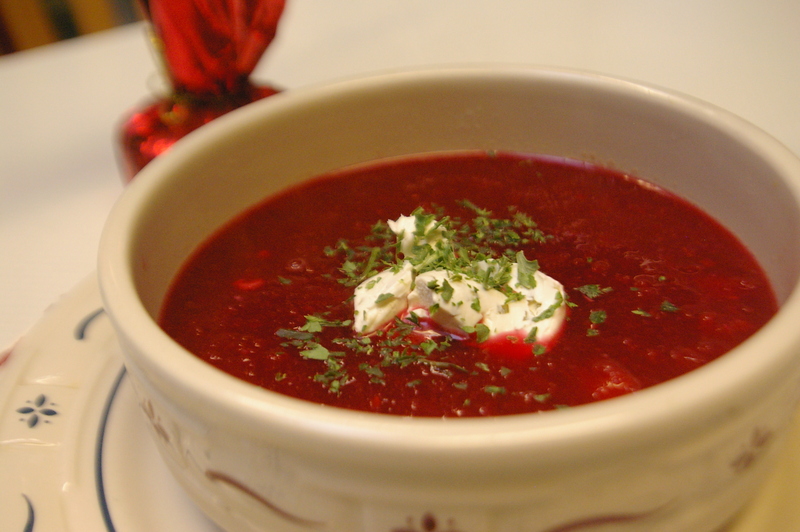 What this post is getting to is borscht. After watching a special with ice dancers Charlie White and Meryl Davis, where they dug into some yummy looking Russian food, my grandmother and I decided this day full of freezing rain and sleet would be the perfect time to make and try some borscht. So here you have it without further babble. Let’s Make it Happen: Let’s start by tossing the tomatoes and onion in a food processor. Dump into a pot with the water, salt, vinegar, and lemon juice. Simmer for 30 minutes. While that’s stewing: skin, chop, and process the beets. Simmer for 10 more minutes before serving it up. I have to tell you I was surprised. I tried with beets a couple of weeks ago. And today I did it again. I made up this story in my head of an overwhelming beet taste and smelling nothing but the earthy beet scent. Then I shut up and took a bite. Freaking yum, those thoughts I was entertaining almost kept with from a delicious meal. Sometimes you’ve just got to dig in first. Oh and I am kind of in love with the US luge team. Kate dancing around the arena is totally my style, when I showed my sister, this video popped up. Basically I want to be friends with luge team. 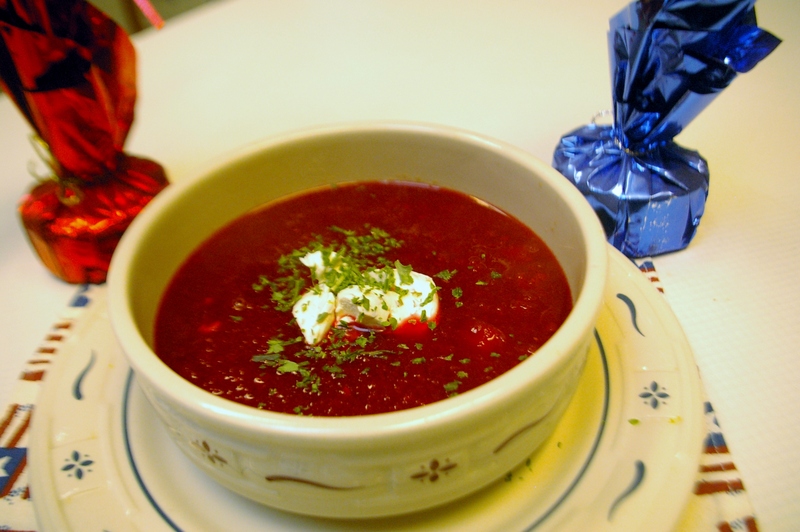 Enjoy your Olympic watching and borscht eating.